Irian Jaya comprises the western half of the huge island of New Guinea situated just northern tip of Australia and at the far eastern reaches of the Nusa Tenggara. It is one of the planets final frontiers both above and below the ocean. 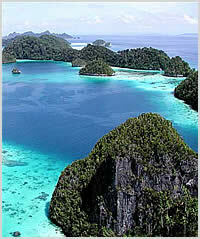 Most of the diving here is concentrated around the recently discovered reefs of Raja Ampat archipelago. Raja Ampat meaning Four Kings is named after the four sultans who once ruled West Papua and is rapidly becoming one of Asia's diving hotspots. The four islands of Waigeo, Batanta, Salawati and Misool are in the part of Irian Jaya known as the "bird's head" peninsular and have earned almost mythical status among divers. According to the Conservation International Rapid Assessment Project in 2002 the marine life diversity for scuba diving in Irian Jaya is considerably greater than all other areas sampled in the coral triangle of Indonesia, Philippines and Papua New Guinea. Irian jaya and particularly the Raja Ampat Islands in the North West are quickly becoming recognised as one of the most diverse and pristine reef ecosystems in the world. With their very low human population which still use only traditional fishing techniques, and their inaccessibility, these islands have still maintained their pristine natural state. Findings include 970 fish species - a world record 283 on one single dive at Cape Kri, the benchmark figure for an excellent dive site of 200 fish species surpassed on 51% of Raja Ampat dives (another world record), 456 coral species (a remarkable 96% of all scleratinia recorded from Indonesia are likely to occur in these islands), 699 mollusc species - again another world high. One of the great things about this area is the variety of reefs and their topography. There are vertical walls, reef flats, slopes, ridges, sea mounds, mucky mangroves, lagoons and pinnacles all of which are affected by a varying degree of current from none to very strong. The visibility is normally very good in the Raja Ampat islands, ranging from 20 to 40 meters varying in the different areas. The north generally has excellent visibility as the water is deep and the islands are small with very little run off. Highlights : Many fish, frontier dive sites, stunning bio-diversity. Getting there : Liveaboard, plane to Sorong.